Joyce Parcher Obituary - Haileybury, Ontario | Buffam Leveille Funeral Home Ltd.
Parcher, Joyce Elsie [Lyttle] - It is with great sorrow the family announces the passing of our dearly cherished Mother, Grandmother, Sister and Aunt who peacefully left us on August 1, 2018. 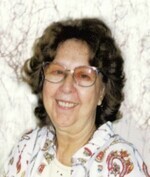 Joyce Elsie Lyttle was born September 15, 1932, on Sunnyside Road in Bucke Township. She was the youngest of eight children born to Camilla "Nellie" Millross and Edward Joseph Lyttle. Mrs Parcher was raised in the Anglican faith and was a life long resident of Moore's Cove. She is predeceased by her parents, her husband of twenty four years Wayne Parcher, her life partner of forty years Rejean Lajoie, her brothers: Kenneth, Hubert, Reginald and James Lyttle; her sisters: Marion [Lyttle] Heard-Ansley and Helen [Lyttle] Fifield-Simmons. She is survived and will be greatly missed by her son John Parcher; great-great-niece and adopted daughter Melanie [Beauchamp] Oslund, son-in-law David Oslund and her sister Mona [Lyttle] Moser. She is also survived by her grandsons: John Parcher Jr., and James Parcher; her adopted grandchildren: Kendra, Miranda and William Oslund; as well as many nieces and nephews and several regarded brothers-in-law and sisters-in-law of the Lajoie family. In keeping with her wishes, cremation has taken place at Lakeview Crematorium. The family will welcome friends at the Buffam Leveille Funeral Home, Tuesday, August 7, 2018 from 7:00 to 9:00pm and on Wednesday, August 8, 2018 beginning at 10:00am. Funeral services will take place at Buffam Leveille Funeral Home Wednesday, August 8, 2018 at 11:00am. Reverend Sherry De Jonge officiating. Interment will follow at Mount Pleasant Cemetery. Memorial contributions to the CNIB [cheques only] will be gratefully acknowledged. Condolences, contributions and memorial candles may be left at www.buffamleveille.com.